UTV Side by Side Speakers. Custom Jeep Wrangler Yj Tj 87-06 Dual 10 Loaded Bass Speaker Box Enclosure New. 1 x CUSTOM JEEP WRANGLER YJ TJ 87-06 DUAL SUBWOOFER ENCLOSURE BASS SPEAKER SUB BOX. 1 x NEW KICKER 2010 C10 10 SUB CAR AUDIO COMP SUBWOOFER. Custom Jeep Wrangler Yj Tj 87-06 Dual Subwoofer Enclosure Bass Speaker Sub Box Specifications. Dual 10 87-06 Jeep Wrangler YJ & TJ Sub Box. Air Space: 0.85 Cubic Feet Per Sub. Dimensions: Width 33-1/4" x Height 15-1/2 x Top Depth 7-1/4" x Bottom Depth 10-3/4. Constructed with High Quality MDF. (2) High Quality Binding Terminal Cups (Accepts Banana Terminal Plugs OR Bare Wire'up to 10GA'). Enclosure is down firing and installs in the rear cargo area. 1987 - 2006 Jeep Wrangler YJ & TJ. 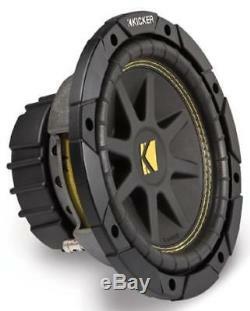 New Kicker 2010 C10 10 Sub Car Audio Comp Subwoofer Specifications. 10 Single 4 Ohm Competition (Comp) Series Subwoofer. Extremely rigid cone, along with 360 degree back bracing eliminates distortion. Double stitched surround for enhanced durability. Tinsel leads woven into the spider with Kicker's Spiralead technology. So you know you want a Kicker system huh? Don't worry about it we have you covered. We now offer pre-loaded Kicker subwoofer enclosures designed to deliver some serious bass. We have designed specific subwoofer box packages that function flawlessly together. By taking the guesswork out of building your system you wont have to spend hours finding the right combination of products. We have hooked up every single system and have heard them for ourselves to ensure perfect sound quality, and output. All package enclosures come pre-wired with the subwoofer(s) installed so all you have to do is connect speaker wire to the terminal cup. It doesn't get much better than that! Its easy to hook this system up to an existing amplifier! 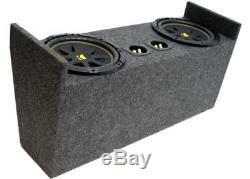 We also have complete amplified subwoofer box packages that include everything you need. Whichever package you choose you can never go wrong with Kicker! Frequently Asked Questions for this Product. Please allow 24-business-hours after ordering before requesting tracking information. How fast will I receive my product? They DO NOT operate on weekends or holidays. Weekend and holidays are not counted as transit days. Each carrier has it's areas where service is better than another and we try to select the best service to get your order delivered in the most timely manner. We are here to help! Our customer service staff will be glad to assist you with any questions or concerns you may have. We have a service member available 5 days a week to answer your questions. All emails are answered in the order they are received and we do answer them all. We reserve the right to switch you to a comparable product if the original product is out of stock or discontinued. Car Audio Packages - Jeep. Car Speaker Packages - Jeep. Empty Sub Boxes - Jeep. Car Audio - In-Dash Receivers. Car Audio - Signal Processors. Car Audio Accessories - Amp Kits. Car Audio Accessories - Capacitors. Car Audio Accessories - Batteries. Car Audio Accessories - Car Audio Accessories. Car Audio Accessories - Car Audio. The item "Custom Jeep Wrangler Yj Tj 87-06 Dual 10 Loaded Bass Speaker Box Enclosure New" is in sale since Tuesday, February 23, 2016. This item is in the category "Consumer Electronics\Vehicle Electronics & GPS\Car Audio\Car Subwoofers". The seller is "hifisoundconnection" and is located in Nixa, Missouri. This item can be shipped to United States.